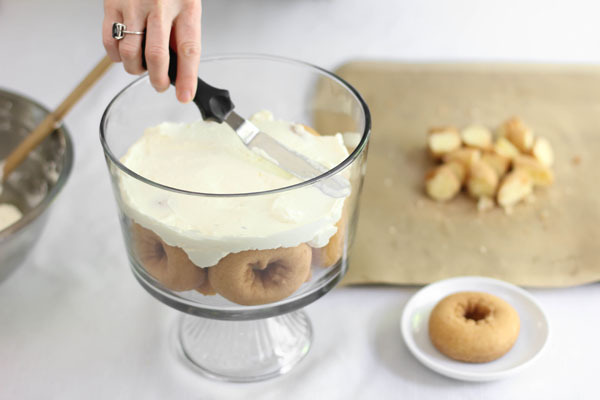 You'll need an 8-inch trifle bowl, or if you don't have one, use a 3 quart glass bowl. Place six whole donuts standing upright around the bottom of the bowl. Next, you'll cube 5 doughnuts and place half of the cubes in the bottom of the dish. Add in half of the whipped topping. Spread it all the way out to the edges of the bowl with an off-set spatula so there's a visible white layer. Slice a few strawberries and line the edge of the bowl with them. The juice will allow the slices to naturally stick to the side of the dish. This is purely decorative, so you can skip this step if you wish. Crumble the remaining doughnut cubes on top of the cream. Layer in the slices strawberries that have been tossed in the preserves. Cut three doughnuts in half and place them around the top edge of the dish. Pour the remaining whipped mixture into the center of the doughnuts. The reserved doughnut and strawberries were threaded on a long skewer and placed in the bowl standing upright, but you could arrange them on top without the skewer if you prefer. 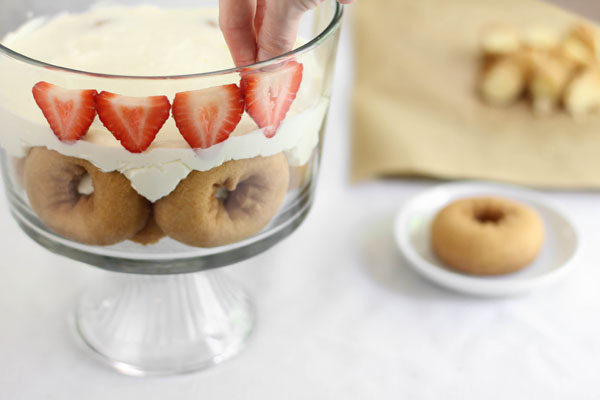 My husband already has plans for a second trifle using his favorite doughnut shop's sour cream cake doughnuts. And me? I'm just waiting for fresh peaches to come in season for a peaches-and-cream version. To make the whipped topping, beat the heavy cream in a large bowl with an electric hand mixer on high speed. When the mixture begins to thicken, add the sugar a little at a time. When stiff peaks form, add in the cream cheese and vanilla extract. Beat until light and fluffy. Set aside. 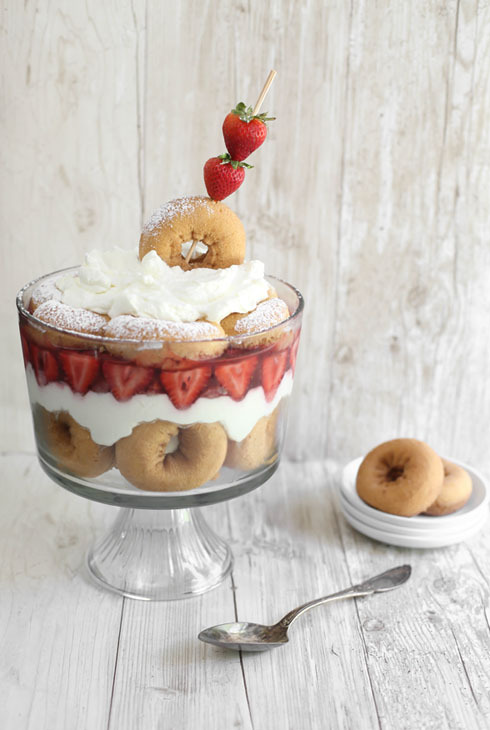 Place six doughnuts standing upright around the bottom of an 8-inch (3 quart) trifle bowl. Cut 5 doughnuts into cubes and layer half of the cubes in the bottom of the trifle dish. 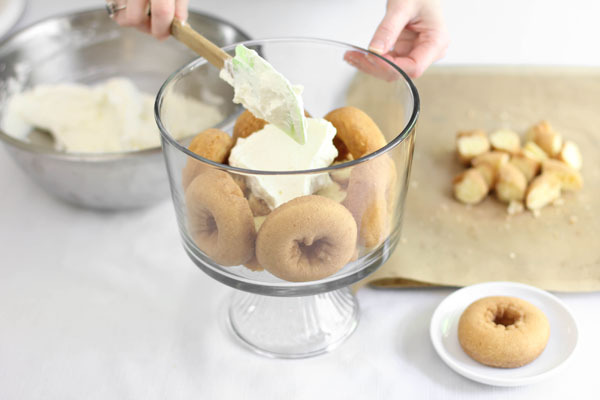 Place half of the whipped cream mixture into the trifle dish and spread it out over the doughnuts and to the edge of the bowl using an off-set spatula. Reserve two whole strawberries for garnish; stem the remaining berries and slice them lengthwise. Make a line of strawberry slices around the edge of the trifle bowl by pressing slices (upright) onto the sides of the bowl. The juice from the strawberries will allow the slices to naturally stick. This is purely decorative, so you can skip this step if you wish. Next, use your fingers to crumble in the remaining doughnut cubes. Heat the strawberry preserves in a small bowl in the microwave (or in a saucepan on the stove top) until loosened and syrupy. In a large bowl, toss strawberry slices with the melted preserves until well coated. Pour the coated berries over the crumbled doughnut cubes. 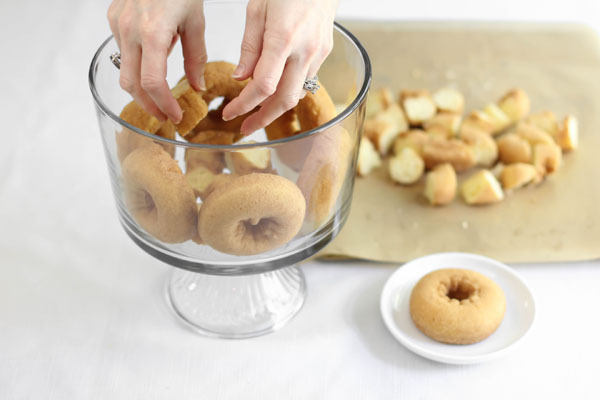 Cut three doughnuts in half and place the six pieces around the top edge of the trifle bowl with the cut ends pointing toward the center of the bowl. Pour the other half of the whipped cream mixture on top of the trifle in the center of the doughnuts. Garnish with the remaining whole doughnut and two strawberries (I threaded the doughnut and strawberries on a long skewer and placed it standing upright in the dessert). What a brilliant idea! I cannot wait to make this. Thanks! Doughnut madness in the best possible way. I Have also experimented with doughnuts and baked into a bread and butter pudding style bake on my blog (because I am living somewhere cold right now). When summer hits I can not wait to try this. Holy moley! What a neat idea!! This is an awesome dessert! Now I'm craving donuts and strawberries! 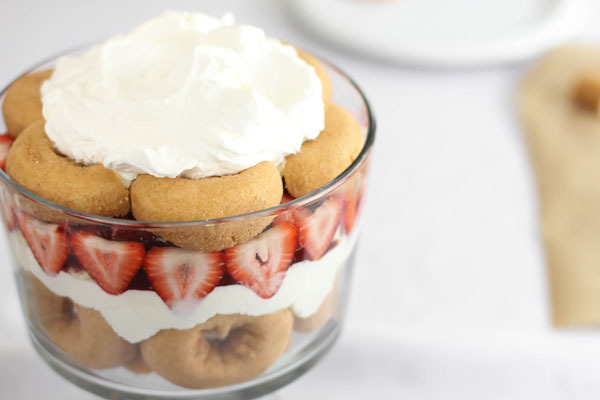 Such a unique way to make strawberry shortcake! Love it!! un vero capolavoro...buonissimo e bellissimo! This is gorgeous and looks delicious! Perfect for summer! What brand of donuts did you use? Oh. My. Goodness. I simply love this! What a fantastic, easy idea. 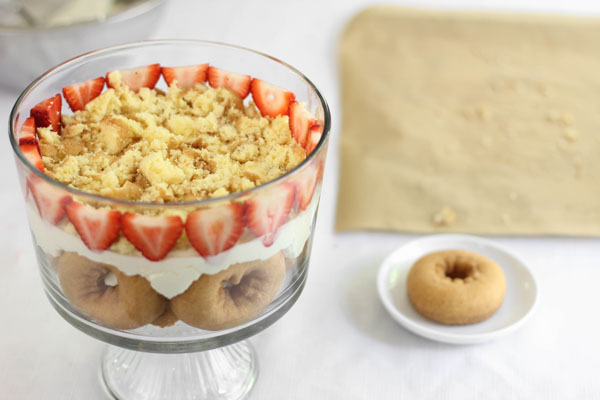 Adore Trifles, think I'll make it with berries and some Amaretto splashed over those donuts! Wow, just wow! This is one amazing looking dessert. This is an epic trifle. One of the most showstopping and yet simple desserts! This is so pretty, so crazy, so delicious looking and just so awesome! You are amazing! ahhhh, I think I will make for my birthday!! Perfect, I think I will make for my birthday ~ this coming weekend! Oh, this looks like an over the top dessert and the best part is it looks so simple to throw together. Thanks for sharing it Heather. The donuts are so cute! Perfection as always. I really feel like I can do this! 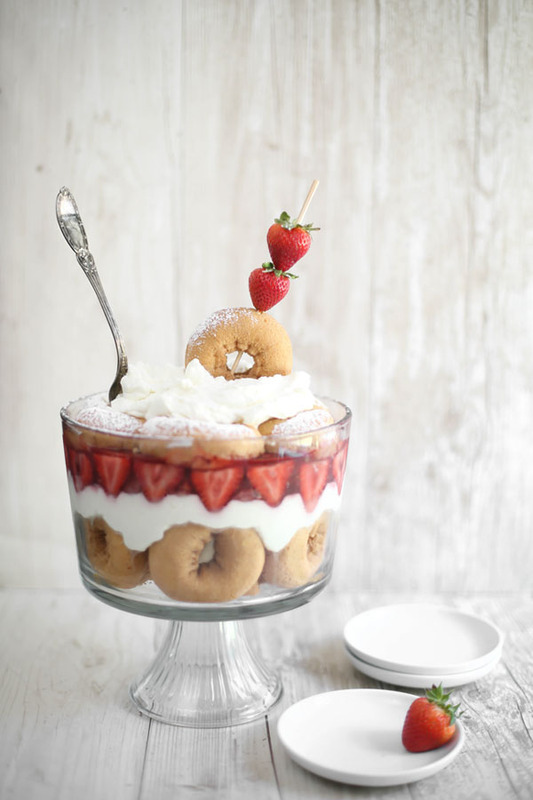 What a great idea to use donuts in a trifle! 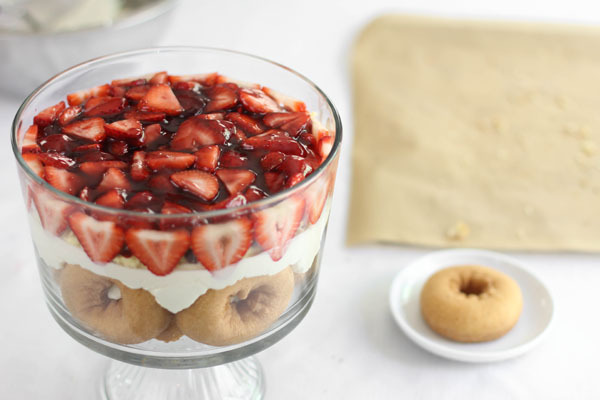 Your Strawberry Shortcake Doughnut Trifle is pure wicked goodness, Heather! If every wife made this for her hubby, there would be a lot more happy marriages out there! You're sooo right about trifle - it's my go to dessert when I need something with minimal effort that tastes great and looks gorgeous! I love how you arranged the doughnuts and strawberries! Oh my god! It looks delicious! yum yum!! Pretty! Know what's even easier? 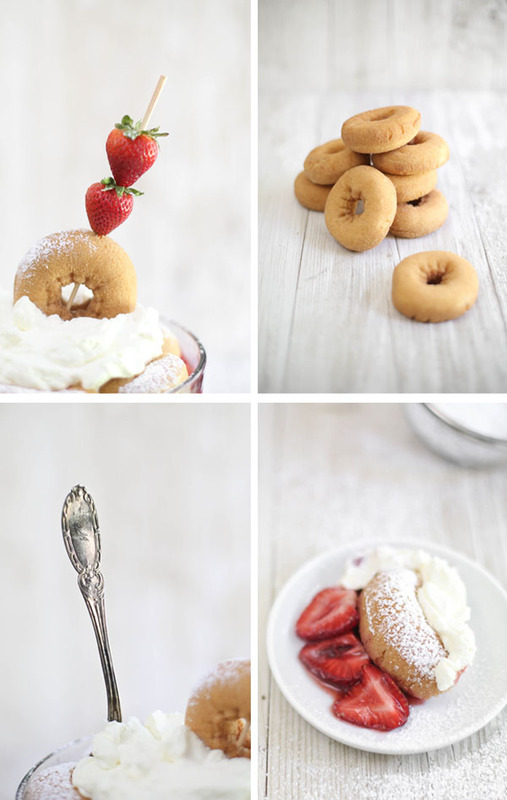 Slice individual donuts horizontally and fill for strawberry shortcake. Love this recipe! My 5 year old daughter saw it and loved it! So she made it for a church potluck. I did all the slicing but she did everything else. Mixing, layering and making sure "doughnut on a stick" looked just like yours. Thanks so much for a great recipe! Do you think this would still be good if I made it the night before and served for breakfast? Thx! I've made this ahead of time and it was perfectly fine the next day! Hi! Do you think this would still be good if I make it the night before and serve for breakfast? Thx!